Stadium of the Year 2018: Nomination process closed, thank you! 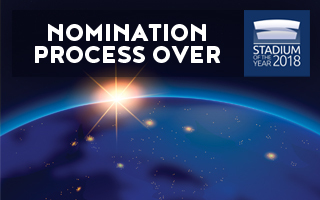 On midnight, Wednesday, we stopped accepting your proposals for Stadium of the Year candidates. The list is 22-stadium long but it's not the end just yet. We're still considering several potential nominees. As every year, for a week we've been open to your proposals for Stadium of the Year nominees. And you've given us more than enough material to work on, also as is tradition! Regular readers and new users have submitted almost 40 stadia to consider. However many of them didn't meet our criteria, particularly by not having been opened in 2018 (like Al Wakrah Stadium, VTB Arena and Tottenham's new stadium). At the moment we can confirm 22 candidates on the list, which will compete for the title of the world's best stadium of 2018. We have to stress that the list is not final at this point, we are still verifying several submitted stadia. They would be added to the list only if we manage to secure sufficient material to present them properly. What we can confirm is that Russian stadia are dominating the list in terms of numbers with 7 representatives, owing the recent stadium wave to the 2018 World Cup. As is customary in recent years, we've also seen several interesting stadia opened in Turkey. Speaking of Turkey, we've made one exception a couple of years back by not including Bursa's new stadium, then nicknamed Timsah Arena, to the list once it was opened for the first time. The decision came because its world-famous crocodile head was not ready at that point, which would significantly impact its chances in both the Popular and Jury votes. Now that the head is complete, it's time to give the stadium a fighting chance. You'll also find Belarus' national stadium and host of this year's European Games, and two very disciplined stadia from Hungary. For the first time, however, we may not have a single candidate from Latin America. Only one nomination from that part of the world was submitted and we are currently looking to find sufficient photographic material to present it. Please keep in mind, the list will be completed by additional stadia at a later date, before the Popular and Jury votes begin. Every internet user around the world will be able to cast one valid vote between February 3 and March 3, so there will be enough time for thorough evaluation of each nominated stadium. Keep in mind, several stadia are still being considered and may join the list.